What in the world is Small Scale Sabbaticals? Some teachers and professors actually take off a whole year every seven years as a sabbatical, but I’m talking about something more frequent. Yes, we typically take off a day every week, but I always wondered: why isn’t there anything in between weekends and a year-long sabbatical? In 2014, I decided to start taking a week off every seventh week. I’d work six weeks and then take a week off. I even started paying all of my employees to take a week off. The results have been incredible. We’ve never looked back. In this episode, we talk about the different kinds of sabbaticals, what to do if you think you can’t afford to take a sabbatical, whether or not it’s possible with a day job, and how you’ll be even MORE productive and get a greater amount of work done than if you never took off time in the first place. We actually see an overall spike in productivity. Learn to get more work done, feel healthier and well-rested, and have a happy team. Carve out the time for sabbaticals if you ever want a chance of it happening (you’ll never just find the time). If you’re in a day job, sabbaticals will probably not be possible. Prioritize overlapping and getting to a point of freedom. Unless your day job can give you a week off every seven weeks, you can’t take a true sabbatical week until you’re on your own. “Not working extra in the evenings” doesn’t count as taking a sabbatical—a sabbatical is intentionally-scheduled nothingness. As much as you might enjoy what you do, you can’t work indefinitely and avoid burnout. Burnout must be prevented from happening in the first place. The point of sabbaticals is to have no obligations. Start scheduling sabbaticals before you feel like you have time. When you take a break from your work, you make your future work better. Sabbaticals are not a luxury—avoiding burnout is not a luxury. 02:22 Sean: Two years ago, we went on this trip with some friends. I said, “I really need a break.” For a long time, I had been thinking about this concept of Small Scale Sabbaticals. I had heard of people taking off a year every seven years. We take off a day every week. I thought, “Why isn’t there something in between? Why don’t we have a Small Scale Sabbatical?” By that, I mean taking off a week every seventh week. Work six weeks, take off the seventh week. 04:05 Cory: Did you decide before going on this trip to Colorado, your first sabbatical? Did you make the decision before, or did you say, “Let’s start doing this,” afterwards? 04:18 Cory: That second one was where you just had to make yourself do it. That’s tough, because there’s work to do. Some people think you can only take a break when it’s convenient, but you have to carve it out. 04:39 Sean: Yeah. You’re never just going to find that time. “Oh look! A week with nothing! That seems like a good time to insert a sabbatical.” Not going to happen. How Can You Afford to Take Off Every Seventh Week? 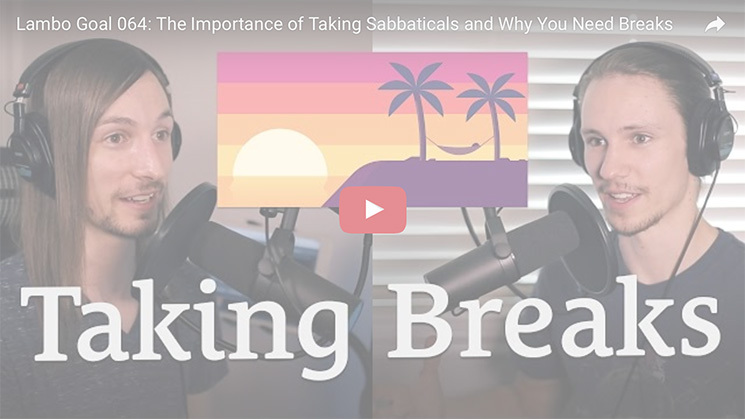 05:09 Sean: This episode is titled The Importance of Taking Sabbaticals and Why You Need Breaks. It’s the what and the why. What do they look like? Why should you be taking them? If you’re wondering about the how, if you’re thinking, “I don’t know how I can do this. I don’t think I can do this. I don’t think I can afford to do this. How in the world can I afford to take off a week every seven weeks? I have a day job. What about my day job? How do I do sabbaticals when I’m overlapping?” If you’re wondering all of these things, I have an entire episode that’s over an hour long with tons of show notes and like a dozen sections that addresses every single one of those questions on the seanwes podcast (Related: seanwes podcast e268 How to Take Off a Week Every Seven Weeks Even if You Can’t Afford To). 06:02 That episode in particular is specifically how to take off a week every seven weeks even when you can’t afford to. It addresses all of those things, like, how can I? Should I wait until I can afford to? Should I wait until I can? Also, the day job situation. Real quick, I want to address the day job thing. I know a lot of people listening right now are wondering, “What do I do? How can I take a sabbatical if I have a day job?” I encourage you to go listen to that episode, but I’m going to give you a brief recap. I’m just going to read from this episode. 07:51 “You’ve got to save money from the day job. You’ve got to hustle on your client work, on whatever you’re doing to make money, you have to build yourself a runway. Overlap out of that. Unless your job is willing to give you a week off, in 99% of the cases, it’s not possible to take a sabbatical at a day job.” I need to underscore that. What we’re talking about today is the what and the why of sabbaticals. That episode covers the how. Sabbaticals are something you can get to, but unless your day job is totally flexible and you make yourself invaluable there to where you can ask for a week off every seven weeks, you will have to wait. We’re pretty cool here. All the team members get sabbaticals. 08:55 Your focus right now needs to be overlapping. Go preorder the book at OverlapBook.com. It’s a step by step guide that will tell you what to do at all of the different stages. It’s going to help you. I want you to still listen, even if you’re in that situation. I want you to prepare for this. I want you to have the context of it. If you’re struggling with the what, why, and how to afford sabbaticals with a day job, listen to episode 268 of the seanwes podcast. What Are Small Scale Sabbaticals? 09:27 Sean: A lot of people get this confused. They don’t understand the difference between the words “sabbath” and “sabbatical.” A sabbatical is something that professors and teachers do. 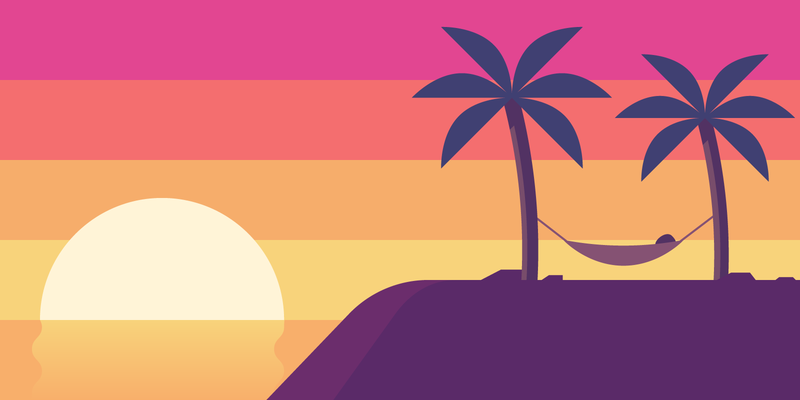 It’s time off of your normal work to research, rest, travel, work on projects, and recharge. A sabbath is a religious thing. This is not a religious thing. Understand the difference between those words. A sabbatical is not a religious thing, it’s just a break. In it’s true sense, a sabbatical is usually a year long. People take a year sabbatical. 10:06 That’s why I call my concept Small Scale Sabbaticals, where it’s once every seventh week and you take off that time. I really enjoy my work, and I think that a lot of us here at seanwes enjoy our work. Some people might wonder why we take time off if we enjoy our work. What’s the point? Why do you take off time? Why do you take vacations or do things on the weekends? Because you don’t get to do what you want to do, and when you have that time, you go do it. Why would you take breaks intentionally if you already do what you love to do? We’re going to get to that. 10:46 I’ll satiate it a little bit right now. The reason, primarily, is that as much as you might enjoy what you do, you can’t just work indefinitely and avoid burnout. Burnout can creep up on you. We’ve done episodes in the past on avoiding burnout (Related: e048 Avoiding Burnout). It sounds like Matt is in a situation right now where he’s working super hard. Sometimes, it’s hard to recognize when it’s creeping up on you. 11:19 It’s the ounce of prevention that’s worth the pound of cure. Once you’ve burnt out, it’s bad. It can be very bad. What do you do? It can take months or even years to recover from a really bad burnout. Isn’t it worth it to prevent burnout from happening in the first place? 12:33 It has to be full off, and you have to take it in. That’s why teachers do six years of an entire school year, and then they take that seventh year off. There’s no sporadic, thrown-in work. 13:23 Before I answer that, he asked another question that I’ll bring in. He said, “I feel like I end up spending the week right after a sabbatical warming back up. My expectation was that I would hit that first week back on fire, but that hasn’t been the case. Are there some practical things I can do that will help me hit the ground running after a sabbatical?” This is why it’s so important for the sabbatical to be focused, pure, and clear of everything. Zero obligations. There has to be intentionally scheduled nothingness during your sabbatical. 14:04 Here’s the number one rule of sabbaticals—when I say “sabbaticals,” I’m talking about my concept of Small Scale Sabbaticals, of course. The number one rule is this: do not schedule things for the sabbatical. You can only decide to do things while you are on the sabbatical. Not the day before. Not three days before. Not one week before. Not the month before your next sabbatical. You can only schedule, decide to do things, or commit to things while you are on the sabbatical. I always say this, but when I get really serious about stuff, it’s because I’m talking to my past self. 15:17 You fill it up because you’re like, “I have so much free time. I’m just sitting around. I might as well do this.” When you get to the sabbatical, when you actually get there, you’re going to be more tired than you realize when you’re scheduling things in advance. You’re going to want and need that rest and recharge time. You’re going to want to be able to not have to do anything, not have any obligations. The worst feeling ever is getting to a sabbatical and then having obligations. It completely defeats the point. The point is not to do nothing, unless you want to do nothing. 15:58 When you’re on the sabbatical and it’s just openness, it’s freedom from obligation, and your friend comes into town and says, “Hey, I haven’t been here in four years. Want to grab coffee?” You can say yes, because you want to do that. Or, you’re on the sabbatical and you’ve rested. You’ve gotten to sleep extra. You had a day or two and you went on a nice day trip with your spouse. It’s super nice. You come back and you say, “I want to make some music. I want to work on some art. I want to pursue my secondary passions. I want to work on a project.” You can do that. You have the freedom to do that and it’s totally okay to do that. 16:38 But it’s something you choose while you’re in it. It’s got to be totally free. If you have any obligations, if you’re shifting all of your chores to the sabbatical, it’s not a sabbatical. That’s why Ben’s coming back from the sabbatical and he feels like he has to warm up. Essentially, that means that he’s having to recover from the sabbatical, which is not good. You’ll know that you protected it and it was pure when you come back and you’re on fire. Like Ben was saying, he’s been expecting this. “Why am I not bouncing back that first week, on fire, excited?” It’s because you didn’t rest. 17:17 Sean: You literally have to rest. That’s why you save the decisions, the commitments, for the sabbatical. In nine out of ten cases, you wouldn’t commit to that thing while you’re in that rest because you know you need the rest. Only once you’ve experienced enough rest to actually recharge can you commit to something. 17:40 Cory: It’s like you said with the obligations. It sounds good at the time, when you plan it in advance. You say, “Yeah, I’ll meet with so-and-so for coffee,” or, “I’ll do this, I’ll do that.” That’s not freedom. That’s not rest. Think about a weekend. My past weekend did not feel like a weekend because I had so much packed into it. It was non-stop and I was working really hard over the weekend, but that’s because I filled it with that. I planned for that. This weekend, I don’t have anything planned. I’m not sure what I’m doing. We’re going to be in Dallas for the conference, and that’s probably going to be a really restful weekend. I can say yes to things. 18:22 Two years ago, when we went to Colorado, that was all we planned. “We’re going to go to Colorado!” It was a very restful week, very relaxing, and very nice. It wasn’t like we had to do a specific thing at 2pm. We had the freedom to choose what we wanted to do, and that’s resting. 18:40 Sean: Matej says, “How do you fight the everlasting urge to create and make especially seen in creative industries when on sabbaticals? I know I should relax and slow down, even though I might be tired I still sometimes question the need of slowing down and I’m afraid I’ll lose hold of things.” If you’re feeling guilty not creating, I want you to listen to Feel Guilty When You’re Not Creating?. That’s going to help anyone, but also, I don’t know if he’s already started doing sabbaticals or if he’s just asking. 20:06 At one point, you’ve got a holiday, a random day, and it’s just enough to stick your head above water and get a gasp of air. Then you’re back to treading water, and it’s constantly waves slapping you in the face. You’re gasping for breathe in between each wave and you’re calling that survival. You’re not thriving. Adina said, “I don’t have enough time to work.” Nobody has enough time to do anything. If you feel like you don’t have time, please, for me, go to episode 268 of the seanwes podcast and listen to that. We help you with the time. You’ll never have time until you schedule it. You have to start scheduling sabbaticals before you feel like you have time. 21:04 Sean: We had a relevant question here. Hannah said, “I schedule monthly sabbaticals and small breaks in my daily routine to rest, but I have a hard time enforcing them. I often skip them because I feel behind in my work or I’m just enjoying work so much they slip by unnoticed. Sometimes I’ll find myself in burnout before I even know what’s happening. I’d like to make myself more accountable when it comes to enforcing breaks and sabbaticals.” That’s really good. You’ve got to get on a consistent schedule. You have to do this. 21:43 You literally have to do this, as seriously as you take anything that you do. When you have to go to the bathroom, do you just say, “Eh”? When you want your coffee, do you just say, “Eh”? When your kids need to be taken to school, do you just say, “Eh”? You do these things because they’re important to you. The reason you haven’t started taking intentional sabbatical breaks is that you haven’t gotten clear on either the benefits or the detriments. 22:32 You’re actually doing damage to yourself by not taking intentional breaks. It’s not good. You’re not doing your best work. People think they don’t have time to take the breaks because they’re behind on work, but you’re not doing good work. You’re stressed! You know it! When I was talking about the waves slapping you in the face, now imagine the waves slapping you in the face and me putting a piece of paper in front you and saying, “Draw! Draw a great picture! Do good work!” The waves are still slapping you in the face. You’re not doing good work. 23:07 You’re stressed and there’s no end in sight, no light at the end of the tunnel. Is any of this resonating? The very dim light at the end of your week that is your weekend that you’ve filled with a bunch of things isn’t recharging you. It’s just not enough. 23:27 Cory: There are two things, and I just thought of it as you said it, Sean. You said, “It’s doing harm to yourself and it’s doing harm to your work.” It’s doing two things that you don’t even realize. I think there are a lot of people listening right now who hear us talk about rest, about taking a break, a sabbatical, a week off, and they think, “I guess I need to prioritize and put a value on rest. I need to prioritize that more.” We’re not prioritizing rest and breaks for the sake of prioritizing rest and breaks. 24:03 When you rest, when you take a break from your work, you’re making your future work better. It’s not just taking a break because we say you need it. There’s a reason we talk about recharging, because that’s what it does. It recharges you so that you do better work. You don’t see that. I’ll make a small call out to one of my friends. Her name is Hope, and her dad is an entrepreneur. He works non-stop. He’s never at the house, the kids don’t know him that well—that whole thing. She told me, “He literally does not have the time.” I said, “I’m sure he doesn’t.” I don’t have a great connection with him, but I was trying to tell her. Maybe this message will get to him eventually. 24:55 What you don’t see is that you’re getting the work done, so you think what you’re doing is working. The work gets done every time because you hustle and you put in the hours. It gets done. You don’t see how much better it could be, how much more you could do. Your work could be better quality. All of these things turn into income. You’re doing better work, so you have more time to focus and prioritize on the things you need to prioritize in your work. We’re not talking about resting just because resting is good, because it’s a good concept. By resting, you are prioritizing and benefiting your work. 25:45 Sean: Scott says, “Do you tend to experience a bad pe-sabbatical hustle? (Trying to rush and get things done before time off. )” That’s the point. Not in a procrastination kind of way. What we’re doing is we’re taking seven weeks worth of work and you’re pushing it into six weeks. You do this. Seven days worth of work? Five days. It’s that simple. It’s a scale thing. Take the week—work, work, work, and then you got a little break. Take that and stretch it. Scale it proportionally in photoshop, and that’s what I’m talking about with Small Scale Sabbaticals. 26:42 You’ve got work and then you’ve got a break. This is something you already do. You cram a week’s worth of work into five days. “What work did you do this week?” People say that. When they’re talking about a week, you only worked five days. You crammed a week’s worth of work into five days. That’s what we do at a big scale. You are not efficient. I’m not efficient. You know how hard I work, Cory, and I still waste time. It’s really simple. If you want to get more work done in less time, don’t give yourself so much time in the first place. 27:20 We give ourselves seven weeks worth of work and we give ourselves six weeks to do it. It’s that simple. You’re kidding yourself if you think you don’t have time. You’re running around. You’re filling up all of your time, but you’re not efficient. What if you had less time to do all of the same amount of work? “I couldn’t do it. It’s impossible.” Not true. I have what seems like an impossible amount of work right now before we leave for our trip so I can go speak—the number of slides I need to make, the things I need to pack… It’s going to get done, I promise you, because that’s the amount of time I have. Things take as long as the amount of time you give them. If you give yourself six weeks to get seven weeks worth of work done, you’ll get it done. 28:15 Cory: That’s a great point. That’s really interesting, too. I think that really helps on how to start implementing that, too. A perfect example is when you, Sean, were writing your first book, Overlap. You gave yourself a certain amount of time and you did it. You actually beat that goal. At WritingaBookinaMonth.com, you show the process of that. I think that’s really cool, because that opened my mind to understanding the concept of things taking as long as you give them. I’ve heard that throughout my life, but it really clicked when you did this project. Things take as long as you give them. 29:01 You will get it done. We’ve had course launches where we were up all night, and we got it done. We said, “This is when it’s due,” so we got it done. You’re going to do what it takes. 30:03 60 years! 60 years, 70 years. Hustle a little extra and get 70 years worth of work done in 60 years. That’s what we’re talking about here. You already do it at a small scale. You get seven days worth of work done in five days. I’m just asking you to stretch it proportionally. It’s not that complicated. You have the time. You have seven weeks. You are choosing every single day not to work at a pace that would allow you to get all of those things done in six weeks and spend the seventh week recharging. 30:38 People think, “Oh, you take a week off? That’s good for you. I’m sure you’re relaxed and stuff. You probably get a little bit less done, but I’m sure you feel great.” No. We get more done. That’s the amount of time we have. When we’re working hard, we work hard. When we rest, we rest. We go all in on the break. When we come back, we bounce back. Not only do we get more done in less time, but every time we come back from a sabbatical, we have a spike in productivity. 31:16 We get more done and we have a spike vs. drudging, monotony, sludge, one day at a time, barely getting anything done. 31:28 Cory: But Sean, they’re still getting work done. They’re not stopping. They’re go, go, go. They’re great. They haven’t stopped working in 12 years… It’s not enough. We’re getting that seven weeks worth of work done in less time, and like Sean said, there’s a spike when we come back. We all come back saying, “Yes, let’s do this. I’m ready.” That fire, that motivation, that energy shows. Why Take Breaks if You Love Your Work? 31:56 Sean: You’re happier. You feel healthier because you rest. You’re happier because you have time. You can do what you want. You can pursue secondary passions. I opened with the question, “Why take breaks at all if you love what you do?” It gives you clarity. When you’re doing the work, you’re not thinking about the work you’re doing, the work you’re not doing, or the work you should be doing. When you take that time off, you have a fresh perspective on everything. I can’t tell you how many times I’ve come back from a sabbatical realizing that I’m focusing on the wrong thing. 32:35 That’s the kind of benefit to the Community that we talk about all the time, getting clarity. You invest time, you get clarity. You come into the Community thinking, “Yeah, I know what I’m doing. Maybe I’ll show people a sneak peak and get some feedback.” You share it, and someone says, “Why are you working on this? Where do you want to go? Do you want to continue doing this kind of work for the foreseeable future?” You were just doing the work. Your head was down, doing the work, and you thought they would say good job or maybe give you some feedback or critique, and now they’re talking about why you’re even doing this work. Are you happy or fulfilled or going in the direction you want to go? Yes, it takes time. If you’re going in the wrong direction, it’s not productive. Instead, invest that time, get clarity, and start heading in the right direction. 33:52 Sean: Hang on, what do you mean? Working on the sabbatical? That’s just it. 33:57 Sean: There are three types of sabbaticals that I’ve observed and experienced in my last two years of doing this. 34:53 We all like multiple things. We’re all good in many things, but if you want to succeed in any of them, you need to focus in seasons. It’s those seasons of focus that will help you climb up to where you want to be. It’s not that you can’t pursue those other things or that they can’t become your thing. I was talking about this in the chat just yesterday. It’s so funny. People tell me, “Everyone thinks of seanwes as lettering.” I’m like, “No they don’t, but I understand that some people do. seanwes is all about business.” I’m preparing my talk for the conference, and I’ve got this slide of all these people we’ve helped. 35:41 We’ve got designers, animators, videographers, photographers, developers, architects, engineers, woodworkers, marketers, writers, speakers, podcasters… so many kinds of people! We help all of them build and grow a sustainable business. But, in the past, I’ve been known for art or hand lettering. The people who came in at that point think, “That’s what you’re always going to be. You’re never going to be able to get away from that.” I understand that it will take some years to shift that perspective for people. It will take some time. It’s funny, and I shared this in the chat yesterday, that so many people don’t know. I say, “Remember when I used to be a letterer?” It’s a joke. 36:26 It’s supposed to be a joke, anyway. Well, remember when seanwes used to be computer repair? A lot of people don’t know that, but that was my business. It wasn’t some other name. Remember when seanwes used to be music? I think Zach or someone shared a link to one of my old music channels, seanwes music on YouTube, and there are some videos on there with half a million to a million views of me just playing some music on the iPhone piano. This was before the iPhone even had apps. People don’t even know that the iPhone used to not have third party apps. 37:08 You could tap on the calculator, the notes, the camera, and that was it. There were no apps. The iPhone launched in 2007 with no apps. Talk about pivoting what you’re known for. Can you even imagine? I jailbroke my phone and I was able to install this third party app on the phone before the phone had apps. It was super cool back then. They were like, “How did you get a piano on your iPhone?” It got super popular. Anyway, seanwes used to be music. seanwes used to be computer repair. seanwes used to be lettering. Now, seanwes is business. You can pivot what you’re known for—it just takes a lot of time. 37:54 Pursue secondary passions in seasons. You can eventually shift to having something be your full time deal, but in the meantime, we all love numerous things. I like to use sabbaticals to pursue secondary passions. Make music, take photos, create art, whatever you love to do. Write, if that’s not your main thing. Project sabbaticals are really fun, but you have to get to the sabbatical and then choose to do the project. Otherwise, if you’re scheduling something to happen on the sabbatical, you’re creating an obligation for yourself. 38:32 The only exception would be the third one, travel sabbaticals. Travel does take a little bit of time to prepare, so you do kind of have to plan ahead. My recommendation would be to try and plan your trip and the location, but don’t jam so much into that. Don’t say, “We’re going to go here and meet this person and then go there…” Go to another location, sure, that’s cool, but keep the emphasis on rest. 38:58 Cory: There’s something else you get from taking time off from work, resting, and recuperating. Like we were saying, you get perspective and clarity. You can have your head down in the sand and just do the work, and sometimes that’s what you need to do, but there’s also something that happens when you have that time off. The first two or three weeks, in the beginning, your mind is going to be on work. “Ah, there’s so much I should be doing!” You have to force yourself to rest. 39:29 It’s a good thing that you’re thinking about work, because you’ll get ideas, like, “We probably don’t need to do this anymore. That’s probably not benefiting our business.” Or, “Why have we not hired this person yet?” You’ll have so many ideas. Otherwise, you would have just been doing the same thing over and over and over. 39:49 Sean: Same thing. One of my slides for my conference talk shows annual revenue over the years. I started working for myself in 2007. It might have even gone as far back as 2006. I wasn’t doing it full time, but I was doing freelance and some consulting stuff in high school. I’ve been working for myself for a decade. If you look at the revenue, the first five years or six years, it’s the same thing. The revenue doesn’t change. The first year I might have made an extra $14,000 on the side. That was cool—for high school. 40:54 You can’t live off of that, but I lived at home with the family. The next year, I might have made something like $20,000. It wasn’t that much. Then it was $25,000, $30,000, $50,000, $55,000. We’re talking years here, six years. Notice the numbers. They’re barely creeping up. What was I doing? The same thing. I’m doing client work for six years. I’m making some money. Gradually making a little bit more money, but not much. Doing the same thing, your head is down, you don’t get any reset point, zoom out point, or clarity, and you’re just doing the same thing over and over and getting the same results. 41:51 The definition of insanity is doing the same thing over and over and expecting different results. You’re insane! At one point, I went from $55,000 in 2012 to over $100,000 in 2013… from client work and a few products. That’s it. How did I double my revenue after six years of nothing but the same? I changed something. Something changed. I got out of that mindset and I started learning. Instead of doing the same things and getting the same results, I started learning, and that was when my revenue doubled. 42:36 I started listening to other people, reading their books, watching videos, learning about pricing, learning about professionalism, learning about licensing, and applying everything I learned to doing my work. On a whim, at the end of 2012, I don’t know why, but I wanted to learn about licensing. I bought some books on licensing. They were kind of outdated books from the 1990s. They were talking about the World Wide Web and how weird it was. None of the terms were made for the internet age. I repurposed them. I learned how to do licensing and then repurposed what I learned for the internet age. 43:20 The next year, I had three opportunities for projects in the next three months after buying those books and learning that utilized my licensing knowledge. In the next year, I made $100,000 as a freelancer. The year after that, $320,000. Now, we’re tripling what I already doubled. How do I do that? More of the same? Something changes. What happened right there, at the inflection point? Something changed. In my conference talk, I’ll go into talking about writing, because writing changed everything for me. 44:10 Cory: Yesterday, Sean was showing me the slides, and he used this little phrase: “Nothing’s changed because nothing’s changed.” I really liked that. 44:21 Sean: In the context of sabbaticals, why are you expecting different results if you don’t change things? How do expect to get clarity without time to get that clarity? 44:32 Sean: Kyle says, “When you’re growing your audience, should you break consistency for the sake of small breaks or make sure content is prepared and publish during the sabbatical?” Do you prepare and schedule your content while you’re off, if you’re trying to build an audience? Or do you break consistency? 44:55 Cory: Here’s what I would do. If this is my first one, I would schedule it out, because I wouldn’t want my reputation to be known for that. Sean, you probably have a different take on that. 45:19 Sean: There’s one reason to be consistent. There are two reasons to break it. 45:29 Cory: If we’re talking about doing seven weeks worth of work in six weeks, why don’t we add that into our work and then it’s scheduled? 46:15 You don’t have to do that or want to do that. It’s totally okay if you don’t, but it’s one thing to consider. It’s really interesting, because of all of the things that I’ve done, including writing a million words in a year, writing a book in a month, launching courses and making six figures, charging five figure rates with clients, I did an interview, and the person who interviewed me mentioned me at a conference talk. The one thing they mentioned about me is the sabbaticals. That’s what stood out to them the most. 46:54 It was really interesting. That’s a way I’ve distinguished myself, among other ways, but that’s something to consider if you want to educate people on it. If you’ve seen the benefits yourself, which may take you some months or years, that’s something you can do. 47:10 Sean: The other thing goes back to Hannah’s question. She’s not consistent with her breaks. She says that she skips them because she feels like she doesn’t have the time or she has too much work. You cannot skip your sabbaticals. 47:26 This is the case with working out, with running, with anything you want to be accountable for. You can’t skip. How do you not skip? The three Ps of accountability: public, partner, and personal. Obviously, if you’re skipping them, you don’t care about your personal accountability. Your word means nothing to you. Sorry, just being frank. You don’t put any weight on your own word. That’s self-discipline. That’s having your own personal accountability—saying you’ll do something and actually doing it when no one else knows. 48:00 It’s not quite the same as integrity, but if you say something and you don’t follow through to yourself, you don’t have any weight in your own word. How do you build that weight? You build it by chaining personal accountability to partner and public accountability. You’ve got this threefold cord. Basically, you get an accountability partner. “Hey, I’m going to meet you at the gym. I’m going to call you and tell you how it went. You’re going to call me and ask me how it went.” Then there’s public accountability, where you make a public commitment. That’s what I did with Small Scale Sabbaticals. 48:38 I said, “Look, I’m going to do this. I’ve been talking about it for many years. I did a podcast episode on it. I’ve done blog posts on it. Here’s why I’m thinking about taking a week off every seven weeks. I think I was just hesitating,” and it was all public. I shared all of it. I said, “I’m going to do it. Every seven weeks, I’m going to take one off.” I make a public commitment. Now, it’s not just my own word and myself, it’s what other people think about me. If I do not follow through with my public commitments, my word and my reputation are tarnished. 49:13 That’s in the eyes of other people, which carries a lot more weight. When you combine all of these together, it’s very powerful and it compels you do things. The second reason to publicly do sabbaticals is to intentionally make other people aware of them so that you become publicly accountable. 49:36 Cory: I like how you called it a threefold cord. It sounds so strong. 49:45 Sean: “What if my day job doesn’t allow me to have a sabbatical for a week? What if I can’t decide the rhythm of taking/having sabbaticals because of my work commitments?” You’ve got to have zero work, zero obligations, zero chores, zero meetings, zero calls, except for the ones that, on the sabbatical, you choose to do. Unless your day job can give you that, it’s not something that’s going to happen while you’re overlapping. Focus on overlapping, focus on getting out of that, focus on getting to freedom. When you have the choice, make the choice to set up Small Scale Sabbaticals for yourself. 50:23 Scott says, and I like this one, “What are some ways your business has benefited from you taking sabbaticals?” We did touch on some of those, but I would have to say the biggest one is fresh perspective. I feel like a healthier person. You get to the sabbatical, especially after you’ve done three of them, and it feels so right. It’s the feeling of working super hard at your day job for five days a week and then sleeping in on Saturday and coming down the stairs and getting a bowl of cereal like you did when you were a kid, Fruit Loops or Lucky Charms, you plop down on your couch, you turn on whatever is on and you don’t even care, and it’s the best. 52:01 That’s how much I believe in it, though. How can I afford to do that? They’re not working. The work isn’t getting done. How can I pay them? We get the work done, and then my employees are happier. They’re more fulfilled, they’re rested, they’re recharged, they feel healthy, and when they come back, they spring back to work. What more can you ask for? What about you personally, Cory? What are the benefits of sabbaticals? 52:29 Cory: It’s been amazing. I’ve been working here since late 2014, and I’d like to count up how many sabbaticals I’ve had here. I don’t even know. 52:41 Sean: There’s 52 weeks in a year and a sabbatical is every seven weeks. If you do the math, you get about 7.4 sabbaticals a year, so by the end of this month, Cory, you’ll have had maybe 14. That’s quite a lot. 53:01 Cory: That’s crazy. My goodness. I’ve benefited from it so much. When I tell people, “We do this thing called Small Scale Sabbaticals where every seventh week we take a week off,” some people roll their eyes, like that’s ridiculous. Their reactions are different. Other people think it’s cool and they’re very interested in that. I want to talk with them more because they get the importance of it. 53:44 Sean: Petra asks, “How do you lose the fear of accumulating work that might be there when you come back?” This is probably related to work that accumulates during the week that you’re off. The main way you prevent it is the same way you “prevent” work on the weekend. If it’s end of day Thursday, Friday’s already planned. You don’t have any openings tomorrow. Someone says, “Hey, I want to meet with you.” What do you do? Do you cut into your kid’s soccer game on Saturday and say, “I’ll meet you on Saturday”? No. 54:32 You say, “I’m available. First thing Monday, let’s chat.” It’s natural. It’s how you think. The same thing happens with a sabbatical. You schedule it. Stretch that model a little bit bigger. You have a sabbatical coming up? Nothing goes on the sabbatical. You want to have a call with me? I’m not available tomorrow. I’m available in eight days. Let’s get it on the calendar. You schedule it. When you get to the point where you have the freedom and the choice to have a sabbatical for yourself and take off a week every seven weeks, most likely, we’re talking about people working for themselves. 55:08 Maybe they have client work or whatever, but you schedule the jobs around it. If the job takes four weeks and you’re starting now and you have a sabbatical coming up in two weeks, you schedule the completion for five weeks. That’s it. You just schedule around it the same way you do a weekend. It sounds super weird. 55:31 Cory: She’s saying there’s fear of work, and the work’s going to be there when you come back, but you’re going to be excited. You’re going to be pumped to tackle it. I wish she was more specific with what type of work. 55:55 Sean: Zach asks, “How dedicated are you to the sabbatical? If you’re on sabbatical, and an opportunity you can’t pass up comes along, how quickly do you break it?” By “break it” I think he means “break” the sabbatical, to take on the opportunity that is so great. Take all of these words in. You should never be in a place where you have to take on a job that requires you to start tomorrow. 57:09 What you should do instead is schedule it out a little bit. Say, “We’re going to start in two weeks.” Then, the next person comes along, and you say, “Great, we’re going to start in three weeks.” Schedule it out so it’s no more feast and famine, “Am I going to pay my rent? I don’t know. I’ve got to take on this job. I’ve got to do the work and make the money!” You’re stressed with short term stuff. Build the buffer for yourself. Build that queue even before there’s a need. 57:39 Even if you’re thinking, “I can’t afford to not do this job,” I would still recommend that you resist that scarcity. Get to a place where you can resist that scarcity and choose to resist it, even when it feels in the moment like you can’t. Push against it. Create that buffer for yourself. You have to create it. It’s going to feel awkward and hard. Push it off a little bit. Create a buffer and a runway a little bit. If someone comes along and they say, “I really need this to be next week,” you have the capacity for it because you’ve scheduled yourself out so far in advance. 58:26 What you can do is, if you want to, at your own choice, you can do the job for a rush fee. You’ve got more clients, more time planned out, you’re less stressed, and you’re potentially making even more money. 58:45 Cory: He was kind of coming up with a “what if” scenario out of fear, I think. I don’t know if that was something that has actually happened to him while he was on a break. I feel like he was more saying, “What if some life-changing opportunity comes up?” Here’s the thing. Most likely, you’re not going to get someone who needs something the very next day, but it happens. Just this month, I’ve had two opportunities where they’ve asked me to do something today or tomorrow. I have to turn it down. That’s too short notice. It would make me great money, but I don’t want to be all stressed and rushing. 59:24 Sean: I think it comes from people seeing the sabbatical as a luxury, and that’s a problem. The sabbatical is not a luxury—avoiding burnout is not a luxury. 59:37 Do you realize how devastating burnout is? You’re done. You’re run over by a bus. You’re in traction. You’ve been in traction, Cory. You had a body cast. 59:48 Cory: That’s right. I broke my leg, my femur. It’s the second worst bone to break in your body. 1:00:07 Sean: You were eight years old in a body cast. You’re done, you’re incapacitated. We want to go play, Cory! Come play! Soccer! You were eight. That’s the worst. When you’re burnt out, you’re done. Avoiding burnout is not a luxury. You can’t afford to be in a body cast. You can’t afford to be run over by a truck. You can’t afford to be burnt out. The sabbatical is the ounce of prevention. It is not a luxury. If you’re sitting on the toilet and someone says, “I’ve got a great job for you,” do you hop off without wiping? 1:00:50 You say, “Awesome! I can’t wait to do the job. It sounds amazing. Great, I’ll be there in 15 minutes. Let’s talk on Monday. Let’s have a meeting on Monday.” Anyone respectable who is worth hiring, who does great work, you better expect to wait. It would be ridiculous for them to be available tomorrow or even this week. Start acting like you’re worth being hired, like you’re worth waiting for, because you are. When you’re on sabbatical, you’re on sabbatical. Stop seeing that as a luxury. When you dream big, people will call you impractical. But you can’t think like everyone else if you want to see different results from them. The Lambo Goal isn’t just about an exotic car. Your Lambo Goal can be whatever you want it to be. It’s about setting goals bigger than you ever imagined.